After the devastating earthquake in Haiti in 2010, a number of individuals and groups had informal discussions to explore various options for the recovery and redevelopment process. Of specific interest was how aquaculture might be implemented to feed the people and develop commercial enterprises that would enhance the long-term food security of Haiti. A one-day meeting was organized to take place in New Orleans, LA on the day prior to the start of Aquaculture America 2011. 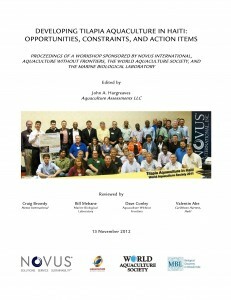 The meeting, organized and supported by Novus International, the Marine Biological Laboratory at Woods Hole, Aquaculture without Frontiers, and the World Aquaculture Society, attracted over 50 representatives from various organizations with interests in helping the Haitian recovery. The prime collaborators in bringing this facilitated discussion to fruition included Craig Browdy of Novus International, Bill Mebane of the Marine Biological Laboratory (MBL), Dave Conley of Aquaculture without Frontiers (AwF) and Valentin Abe of Caribbean Harvest. Novus International provided funding support while World Aquaculture Society provided meeting room logistics and support. John Hargreaves gathered up the discussion notes arising out of the workshop and has produced a proceedings report that highlights the identified needs and priorities to support aquaculture development in Haiti entitled – Developing Tilapia Aquaculture in Haiti: Opportunities, constraints, and action items. Click on the report title or the cover graphic above to download a PDF copy. Also included in this proceedings are the presentations made at the workshop, a list of participants, and backgrounders on the situation in Haiti with respect to aquaculture.